The chart pattern train ain’t got no brakes! And today, I’m serving up a couple more, with GBP/CHF and GBP/NZD in focus. Sellers have been trying to kick GBP/CHF lower, resulting in ever lower peaks. However, bulls aren’t giving up easily and have apparently entrenched themselves at 1.2630. And in the process, a descending triangle pattern has emerged. 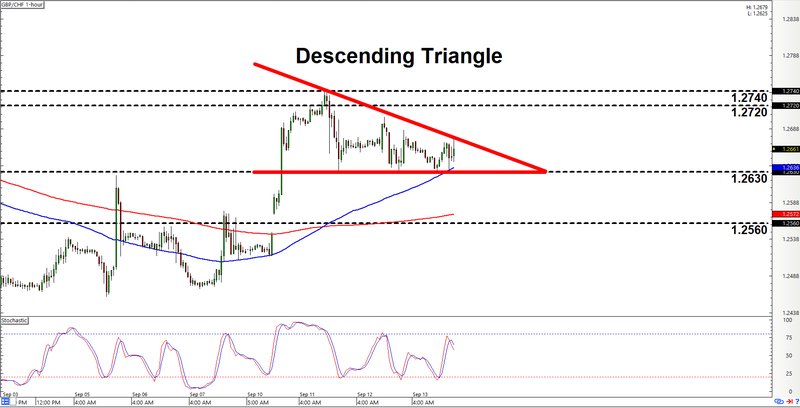 As the name implies, a descending triangle is a bearish chart pattern. We’re therefore mainly bearish on the pair, and we’re lookin’ to go short if the pair breaks lower past 1.2630. If such a scenario plays out, then bears will likely be gunning for 1.2560, although the pair could still potentially move lower. However, do note that the descending triangle formed after an uptrend. Also, them moving averages are still in uptrend mode. There’s therefore a chance for a topside breakout as well. And clearing the areas of interest at 1.2720 and 1.2740 would be a good sign that bulls are in control. 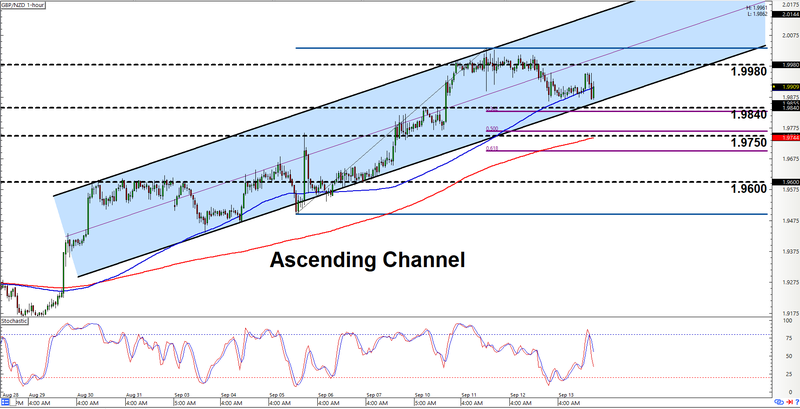 An ascending channel has recently formed on GBP/NZD’s 1-hour chart. And as y’all can see, the pair is hovering just above the area channel’s support at 1.9840. And if we apply our handy Fibonacci tool, we can also see that 1.9840 is just above the 38.2% Fibonacci retracement level, which is another technical argument in favor of support forming there. However, there’s a chance that the pullback may be deeper since the pair could potentially move even lower to the 50% retracement level, which lines up rather nicely with the 1.9750 minor psychological level. But if support fails to form at 1.9750 and the pair keeps going lower after that, then you may wanna think about switching to a more bearish bias on the pair, especially if the 1.9600 major psychological level is breached. On the flip side, if support forms and the pair moves higher, then just watch out for 1.9980 since selling interest seems rather strong there.